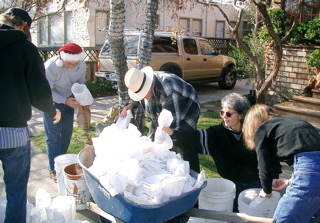 Christmas morning: The usual post-luminaria routine is to wake up, do the presents, then go out on the street to pick everything up: gather the luminaria remove the candles, dump the sand, and fold up the bags so they can be reused next year. But there was a heavy frost last night and the bags were all pretty much soaked this morning, so Piero decided we’d just recycle them and use new ones in 2005. He’s the boss. Our neighbor Kay Schwartz, above, was the first one out this morning, and she pretty much picked up all the bags from the upper block of Holly Street. Then we hauled everything down to the Martinuccis to pull it all apart. Most of the usual suspects were there (below). 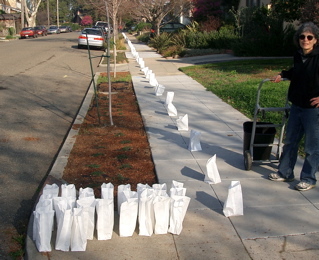 It probably takes a total of two hours to set the whole thing up on our street — more if you have to get the 600-plus bags ready first — and about the same to take it all down again.